Performers include: Mamie Gummer, Justin Hartley, Aja Naomi King, Kelly McCreary, Harry Lennix, Necar Zadegan, and Michael Rady. Emily Owens (Mamie Gummer) thought that she was done with the world of high school. After all, she graduated years ago and has now finished medical school as well. Unfortunately, her years as a geeky girl have come back to haunt her. Emily is beginning an internship at Denver Memorial Hospital, a facility where her med-school crush Will Collins (Justin Hartley) is also an interning. Unfortunately, her high school nemesis, gorgeous and popular Cassandra Kopelson (Aja Naomi King), is also interning at Denver Memorial as well. Another intern, Tyra Dupre (Kelly McCreary), warns Emily that the cliques at the hospital are all too familiar: the jocks have become orthopedic surgeons; the mean girls are in plastic surgery; and the rebels are in the ER. Tyra has her own awkward place as “the principal’s kid” since her father, Doctor Tim Dupre (Harry Lennix), is the chief resident. Tyra latches onto Emily as a new friend, and immediately begins confiding in her. Nothing is too personal to share with Emily — Tyra is a lesbian, that she hasn’t come out to her father yet and she’s interested in dating a certain nurse. Emily soon realizes that the long-standing rivalry she had with Cassandra back in high school is only going to grow. Both Emily and Cassandra are competing to impress brilliant Doctor Gina Bandari (Necar Zadegan), a world-famous cardiothoracic surgeon who’s been an inspiration and role model to both of them for years. While Emily and Cassandra vie for Doctor Bandari’s approval, they’re also competing for Will’s attention. Handsome Will and Emily were friends in medical school but Emily was always hoping for more. Will has made it clear that he likes their relationship the way it is — as just friends. Emily struggles to convince herself that being friends with Will is enough, but it bothers her to see Will and Cassandra even talking with one another. Meanwhile, Emily is also getting to know Doctor Micah Barnes (Michael Rady), a nerdy yet smart and handsome resident. Micah is faced with serious medical issues within his own family, and Emily’s compassion proves an invaluable help. Impressed with Emily’s medical skills and warm bedside manner, Micah brings her in on a delicate surgery and talks her through the procedure, boosting her confidence and bringing them closer — both professionally and personally. With the long hours, the heavy workload, and personal drama filling her first days as an intern, Emily still fees like she’s the new geeky kid all over again. It’s just as awkward as high school. Somehow however, she’s sure that she can make it. Emily’s decision about starting a relationship with Micah becomes even more complicated when Will hears about it and begins to feel jealous. Emily and Tyra treat an unruly woman, but after learning of her home hoarding situation, Emily wonders if the woman’s personality changes may be caused by her many cats. Now that Cassandra and Will have broken up, Cassandra’s strictly professional behavior distracts Will and causes him to misdiagnose their patient. Meanwhile, Micah’s sister comes to town after finding out the truth about their mother. What do you think? 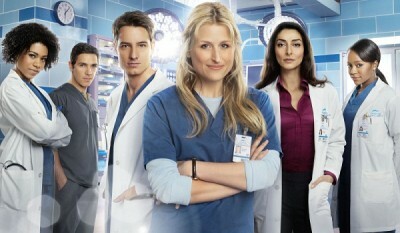 Do you like the Emily Owens, MD TV series? Do you think that it should have been cancelled or renewed for another season? Emily Owens, MD: Is the New CW TV Series Worth Watching? Just read that Mamie aka Emily is the daughter of Meryl Streep and Don Gummer. Good show good acting, Disappointed on the early cancellation. I really enjoyed this show, and would love for it to come back. Why was Emily Owens ND cancelled? I loved it! Loved this show. Bring it back. Love this show! So good. I enjoyed ever episode. I love this show, couldn’t get enough…. I can’t believe it was cancelled!!!!!!! !